Denys Baptiste landed in Finland with his band, fresh from receiving the well-deserved accolade ‘Album of the Year’ in the UK Parliamentary Jazz Awards, arriving in Tampere, two hours north of Helsinki, in the middle of the city’s 37th annual International Jazz Happening. The festival is at the start of winter, positioned to cast light and warmth into the lengthening days and long winter months ahead. 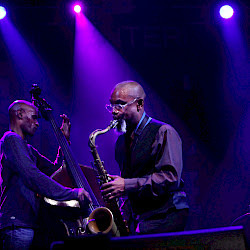 The quartet delivered an incandescent set on the Saturday night, based on their album The Late Trane, to a rapturous reception in the main hall of the city centre’s Old Custom House. They are a formidable unit, with Rod Youngs on drums, Larry Bartley on bass and Nikki Yeoh on keyboards driving Baptiste on. The repertoire of the late Coltrane years was reworked in their hands to give it a contemporary and personal edge. Yeoh conjured growls, ghostly choirs and squelching, funky voices from her keyboards and laptop as often as she turned to the piano on stage, whilst Baptiste extended yet further the emotional range of his horn with judicious use electronics. Living Space was introduced with atmospherics and shifting textures, before the rubato theme uncoiled, and bustle and accompaniment thickened. It morphed into a funky groove with a snappy, pulsing bass riff for Ascent, Larry Bartley really digging in. Peace On Earth saw an extended piano intro from Yeoh before an affecting duo with Baptiste. After The Rain was given an easy, delicate, lilt and a twist with a country flavoured chord progression providing a platform for lyrical soloing. If these were the prepared templates, what set them on fire was the energy and interaction the band poured in. On Ascent the tenor swirled and swooped, squawked and screamed as the rhythm section goaded Baptiste into an ever more impassioned statement. On Vigil it was Youngs unleashing a firestorm from the drums before Yeoh and Baptiste found a medley of effects and voices. It was a thunderous, emotional performance and the packed hall loved it. They were the lone UK band in a diverse, layered programme that encompassed all points of the musical as well as the geographic compass and in which, The Late Coltrane was a festival highlight.